This week our team passed 100 leatherback encounters for the season. We are currently at 114 encounters and the peak of season is still a few weeks away. We have seen a total of 71 individuals. 15 of those were new, untagged turtles. This week alone we have had 21 encounters. Our most frequently encountered turtle this year is Rosa. We’ve already seen her lay six nests! We have seen Harmony four times and we have ten turtles that we’ve seen three times. We have quite a few turtles that nest exclusively on one beach. One of those turtles is Taro. We tagged Taro in 2016. We’ve seen her three times this year as well. Each encounter with Taro has been within 3 miles of beach. On the other end of the spectrum we have turtles like Valkyrie who has nested on Blackbeard Island, GA in 2010, Melbourne, FL in 2016, and with us this year. We have a tiny turtle nesting this year too. Well, tiny as far as leatherbacks go! Chakra, a turtle we tagged in 2015, is just 135.5 cm long (carapace length). Our average carapace length is 154 cm so Chakra falls well below that. Benatar, one of our new girls this year, is 165 cm long. We have now seen her three times and she’s a big, healthy turtle. The largest turtle we’ve ever seen is 176.5 cm long! While not terribly long, Agape has nested twice and both times the surveyor noted that she was incredibly fat! A great sign that the girls are finding some good foraging locations. We have seen one turtle originally tagged in Georgia in 2010, one turtle originally tagged in Melbourne, FL in 2010, and one turtle tagged in Palm Beach County earlier this year. Some girls are wanderers. We have seen Poesy several times as well. In 2013, biologists now working for our team found Poesy with a rope, likely from a crap pot, wrapped tightly around her neck. They were able to successfully remove the rope but Poesy now has a pretty significant scar around her neck. 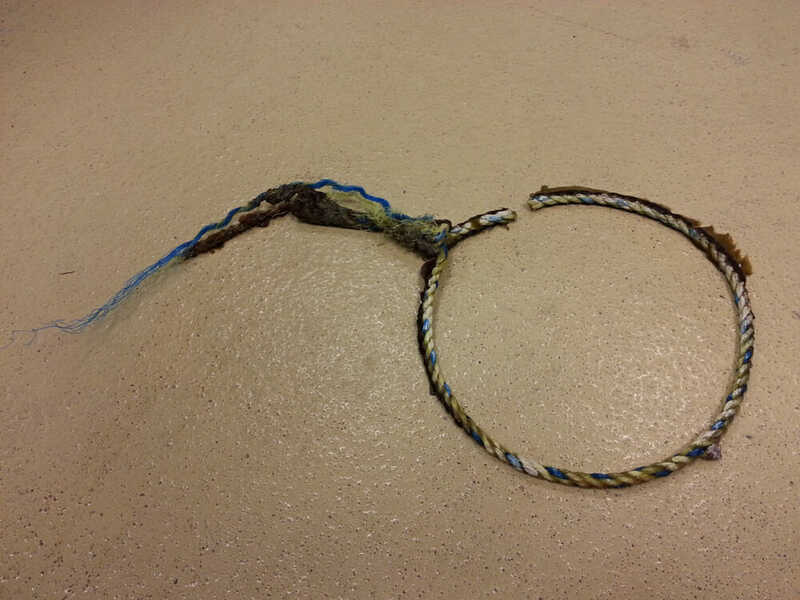 The image below is the rope shortly after it was removed and it shows where it had to be cut to remove it from Poesy’s neck. Keeping garbage and fishing gear out of our oceans is one way that we can help keep sea turtles safe and we need to ensure that we’re doing our part to help out. We are looking forward to May, which usually brings the highest number of leatherbacks. We hope to see a few new turtles or some that we haven’t seen in a few years. We’ve had quite a few turtles nesting this year that were tagged over a decade ago and we’re thrilled to see them return! We’ll update you soon.